§ 48. NOT very long afterwards, the same servant of God, Cuthbert, was summoned to the same city of Lugubalia, not only to consecrate priests, but also to bless the queen herself with his holy conversation. 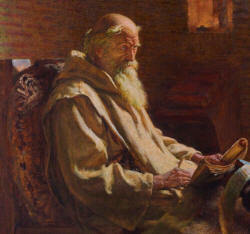 Now there was a venerable priest of the name of Herebert, who had long been united to the man of God, Cuthbert, in the bond of spiritual friendship, and who, leading a solitary life, in an island in the large marsh from which the Derwent arises, used to come to him every year, and receive from him admonitions in the way of eternal life. When this man heard that he was stopping in that city, he came according to his custom, desiring to be kindled up more and more by his wholesome exhortations, in aspiring after heavenly things. When these two had drunk deeply of the cup of celestial wisdom, Cuthbert said, among other things, “Remember, brother Herebert, that you ask me now concerning whatever undertaking you may have in hand, and that you speak to me about it now, because, after we shall have separated, we shall see each other no more in this life. I am certain that the time of my death approaches, and the time of leaving my earthly tenement is at hand.” Upon hearing these words, he threw himself at his feet with tears and lamentations, saying, “I beseech you by the Lord not to leave me, but be mindful of your companion, and pray the Almighty goodness that, as we have served him together on earth, we may at the same time pass to heaven to see his light. For I have always sought to live according to the command of your mouth; and what I have left undone through ignorance or frailty, I have equally taken care to correct, according to your pleasure.” The bishop yielded to his prayers, and immediately learnt in spirit, that he had obtained that which he had sought from the Lord. “Arise, my brother,” says he, “and do not lament, but rejoice in gladness, for his great mercy has granted us that which we asked of him.” The event confirmed his promise and the truth of the prophecy; for their souls departed from their bodies at one and the same moment of time, and were joined together in a heavenly vision, and translated at the same time to the heavenly kingdom. But Herebert was first afflicted with a long infirmity, perhaps by a dispensation of holy piety, in order that the continual pain of a long sickness might supply what merit he had less than the blessed Cuthbert, so that being by grace made equal to his intercessor, he might be rendered worthy to depart this life at one and the same hour with him, and to be received into one and the same seat of everlasting happiness.